WEST HARTFORD, CT- In a hard fought match, the Hartford Hawks edged the Central Connecticut State Blue Devils 3-1 in their home opener on the U of H campus Wednesday night. The two schools at opposite ends of West Hartford essentially, with Central just over the border in New Britain, are frequent opponents, and the Hawks were able to take a win over an in-state team after a narrow loss to Quinnipiac mere days ago in Hamden. As always these reports are heavily offense oriented since it’s easier to track. This is not meant to denigrate the valuable contributions of defenders or those assisting the offense in kills. Set one opened with Hartford pulling out to a 6-1 lead and Central calling a quick time out. When play resumed the Hawks kept up the attack and the score reached 13-4 before CCSU picked up some steam getting the score to 15-10, though a Hartford run put it at 17-10 leading to the last Blue Devil time out. 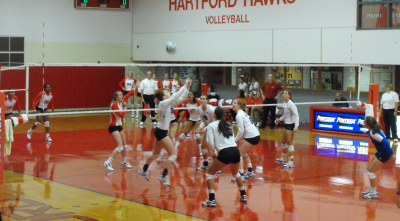 The two teams then settled into essentially trading points until Hartford picked up the 25-15 win in the set. Hartford Highlights included: Michelle Cordell scoring the first point of the game with a whack to the defense’s right corner, Kami Nethersole lined up one of her many kills, on an ensuing play, Dionna Kirton had a good defensive save, Nethersole struck again from the net, and Cordell served up an Ace, Nethersole then hit the ball into a gap, Nethersole and Scott’s block, Scott’s solo block soon afterward, and a Rocket of a kill off a set not long after that either, Cordell picked up a kill and also served up an ace just in bounds to the point the defense was sure it was going out, Nethersole soon delivered a titanic spike when set the ball, and followed it with another kill as well as a cross court blast in response to a Central point, Kirton got in on the scoring with two straight kills, and Cordell scored the game winning point when here attack flew off a defender and out of play. CCSU Highlights included: One of many defensive saves by libero Kaitlin Petrella early on, later Blaike King got Central’s 2nd point of the day, Maite Mendizabal added a kill off the blockers to the floor, and later had a good defense save as did Amanda Bayer and Tori Vaughan during a long rally, Mendizabal and Vaughan combined on a block, and Bayer used a one handed put over to a score another point. Vaughan and King then shared a block, several of CCSU’s later points came off Hartford errors. Set two went more Central’s way to start as the visitors picked up a 12 to 6 lead prompting a Hawks time out. The home team exploded to 4 quick points and cut the deficit two and Central called time The chase was now on with the blue and white trying to hold the lead and Hartford steadily keeping up. When the score reached 18-17 Central called another time out and pulled ahead again to 20-17. The Hawks called time and emerged back on the chase fighting to a 23-23 tie. The red and white surged to two more points and the 25-23 set win. Hartford Highlights included: Cordell opened the scoring for U of H with a missile, Kirton whammed a ball over early on, and smacked a kill off the blockers and out, Nethersole sent a cross court kill off the defense’s hands, and Kirton served an ace up immediately afterward, Lindsay Ford had a good defensive save in the mix and libero Danielle Etta had a very good dig, one of her many defensive efforts throughout the day. Ford sent an attack in which was not returned a few points later, and Scott spiked the ball over. Kirton’s tap to a gap in the lines kept the deficit at 2, Nethersole then struck, and following a CCSU point, she unleashed a cross court slash to cut the lead to 1. Amidst a back and forth there Ford had a good dig, the Hawks benefited from a Central attack out of play and Ford’s service Ace took the set. CCSU Highlights included: King’s early kill got the scoring started and she added another, Jamie Rademacher and Bayer then put a tandem block together, and Rademacher sent a spike off the blockers and outside the lines, Sara DeLacey then tapped the ball the blockers, later Mendizabal didn’t let the Hawks block from stopping her attack, and DeLacey and Vaughan shared a huge block. On the ensuing play Bayer came up with a good save though Hartford got the points. Mendizabal sent another kill off the blocking attempt, and Vaughan wasn’t far behind with a hammered spike. King used a tap for another point and Rademacher cross court smashed the ball into the corner. She added a block, and several points later received a set and just kablammed a kill over at high speed, Mendizabal wasn’t far behind with a big kill of her own, Petrella had a key dig late as well. With the match on the line, set 3 was a very back and forth affair with each team nearly alternating points all the way to 16-16. Central then pounced and pulled slightly ahead racing to 25 and Hartford only picked up one more point in the process. Hartford Highlights included: On an early long back and forth Ford and Scott each had a big defensive save though the point went to CCSU, Kirton then crushed the ball of the back corner, Etta came up with a diving dig to keep the ball in play, though Central picked up the point, but Scott attacked, and several points later Kirton sent the ball cross court, and not much time passed before a smash flew from her hands, Cordell got in on the action with a kill, and Nethersole tied the game at 11 with a kill, and then taped through the blockers, after some rrors back and forth Cordell whapped th eball off the defenders though as Central took the lead and held it, Ford came up with another key save. CCSU Highlights included: Vaughan opened up the scoring with a put over, Bayer had a kill early, DeLacey poked the ball over and off the Hawks defense, Mendizabal used a light touch as well, later Rademacher sent a kill over, and Vaughan struck twice in near rapid succession, later Bayer hit another one in, and King sent in a kill, DeLacey hammered down an attack, and Vaughan hurricaned a kill to tie it up before Amalia Ashley’s service ace took the lead that they would never surrender. Vaughan had another blast, Rademacher received a set and absolutely bombarded the home team with her kill, and she and Bayer’s block helped nearly seal the deal, King struck again and an error gave CCSU the win for the set. Set 4 opened with a Hartford run and the Hawks built a lead only to have CCSU tie it back up 13-13. Hartford then picked up three quick points and the Blue Devils called time again, The Hawks kept up the pressure pulling the score to 23-16 and the eventual score of 25-18, giving Hartford the set and the match. Hartford Highlights included: Cordell once again opened up scoring for her team by winning a joust for the ball at the net. Nethersole’s blast was point number two, on an ensuing play Scott came up with a desperate defensive play, allowing Nethersole to return the ball, and eventually set up a Hawk’s point, Scott later tipped the ball in but the defense couldn’t return it, Scott struck again to take the lead that U of H never relinquished, (except for a tie later), Kirton added a spike later, and Scott had another kill sent bouncing off defenders and out, she then teamed with Lindsay Makowicki on a block, later Cordell scored again, following a good save by Etta a teammate whipped the ball off the blockers. Ford and Cordell stuffed the Blue Devils with a block, and as the set was closing Cordell took a set and just crushed it. A few attack errors later and the set and match went to the home team. CCSU Highlights included: Rademacher picked up a point when the ball ricocheted off the defenders and out of play, Caity Van Camp had a cross court kill to the gap, later DeLacey added a block, and Vaughan had two straight kills, followed later by King, and Rademacher adding to their totals, as the set moved on DeLacey had another block, and Van Camp came up with another kill, with Vaughan joining the scoring. Late in the set, Van Camp and Vaughan each got more kills before the end.